Previous articles discussed the sustainability stair climb in general terms. In this article we’ll outline a specific strategy to make real progress toward long-term sustainability goals. Here’s why it’s important. Your financial investments right now may be making 2-8% in conventional places like banks and money markets. Alternatively, sustainability can give you a return from 10-80%, and your investment stays in your home where you can see and feel it. In this article you’ll learn how to calculate that return and how to make it snowball so you can re-invest it. Rebates or other programs give you short-term rewards for changing behavior, but if you’re going to climb the whole stairway you need a way to see longer-term progress and set bigger goals. A $100 rebate doesn’t help you as much as saving $100 every year, and using fewer fossil fuels this month doesn’t motivate you as much as eliminating them completely. In this article we describe how to track money saved during your sustainability efforts, in addition to the intangible benefits such as time-savings, convenience, comfort, safety, and quality of life. This will involve using spreadsheets, which we’ll show in sections. There will be a link to the complete file, which should work with most spreadsheet programs. Right now you are investing money every month in your utilities (for now we’ll focus on just electricity, but we’ll talk about others in upcoming articles). It isn’t a very good investment because none of that money you send to the utility company ever comes back to you, except in temporary benefits of light, heat and work. If you could get those benefits while also getting money back you’d be a much smarter investor. If you were investing in a stock or bank account you would record how much you invested, how much you got as a return and then calculate the annual rate of return (using the spreadsheet function IRR() – Internal Rate of Return). You can do the same thing for energy investments. Let’s take the example of converting your lights to LEDs. Assume that your home has four 100W incandescent light bulbs you use the most, they are on for an average of four hours each day and your electricity cost 15c/kWh. Other assumptions are listed in the table below. Note that amounts have been displayed in round dollars for simplicity (the calculations are still done to the penny). At the end of a year, you will have saved $67 from a $16 investment for a 77% return. You may decide that you want to use some of the savings to replace all of your lights in the house to get the same intangible benefits. Can you still save money overall? 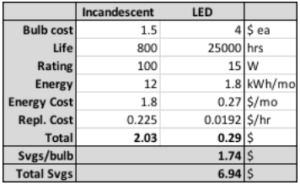 Assuming that you replace a total of 20 bulbs in your house, their total use is equal to another single incandescent bulb left on 4 hour per day and because you are buying in bulk LEDs now cost $3 each. Here is how things change because you are changing 20 bulbs instead of 4. Now, even though you spent more money up front you’ve still saved $44 over the year for a 12% return. If you carry the calculation out another year you’ll find that you save the same amount of money in both scenarios. As with any return you can either spend it, or re-invest it in further energy upgrades like a smart thermostat, insulation, replacing doors and windows, installing solar panels or buying an electric car. Each one will give you a return, some quicker than others. You can think of your accrued savings as your account to invest in saving more energy, and it keeps getting bigger and moving you higher up the stair climb. These savings tell you how you’re doing compared to a baseline, but that’s a relative measure which is best for short-term comparison. For the long-term you’ll want to have an absolute measure of your energy effectiveness – how much money or energy you’re using over the entire year. To get this you’ll need a record of your energy use for a representative year (or average of several years) which you can get from your electric company. Below is an example (note that the connection charge is $20/month and the rate is 15c/kWh). The annual energy usage is reduced by 4% and the cost by 3% (51kWh and $92). Note that the reason the cost isn’t reduced as much as the usage is the connection fee, which doesn’t change. When comparing your household usage to others you should do it on the basis of building square footage to account for differences in size – in the case of this 1500sf home .10 kWh/sf and 2.9c/sf. The spreadsheet for this article can be found here. The next article will give examples of other energy upgrades you could make including some, like solar panels, that have a much longer payback period.